TrendMicro, the well known and reputable security company has issued what they describe as an “urgent call to action” following the discovery of two critical vulnerabilities in Apple’s QuickTime player. What makes this situation “urgent” is that Apple is in the process of deprecating QuickTime for Windows and will no longer be issuing security patches for the product, so these 2 vulnerabilities are never going to be fixed. Bottom line: Some may remember a time when Apple iTunes required users to have QuickTime installed on their computers, however, this is no longer the case. In fact, most modern systems do not require QuickTime. 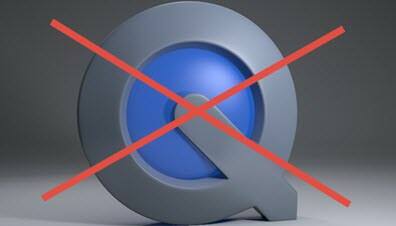 These two serious vulnerabilities, which leave the system open to exploitation, are never going to be fixed and the best solution is to uninstall QuickTime as soon as possible. I will uninstall anything that has to do with Apple on any Windows PC that comes my way. I tell my users that if you want to run Apple then buy a Mac. Most of my users never even run the software and the one’s that do, well their are other alternatives. One can uninstall by using Program and Features, although I will usually use Geek Uninstaller and let it clean up all the registry entries and then use Ccleaner to clean up any obsolete registry keys. I am not surprised that Apple is doing this. Jim, when I saw this in the news, I wondered why the Feds did int include Safari for windows. Apple has made it clear that they will no longer support Safari for Windows. An unsupported browser actually would actually scare me for than a program. Also we just had a reader complain about not being able to reinstall iTunes after uninstalling it on Win 10. I have found Apple products like Bonjour, iTunes and others to require an uninstaller other than Window’s native uninstaller because they tend to leave bits of code in the registry. While it is OK in previous versions of Windows because Microsoft offered Windows Uninstaller Clean UP utility, they do not offer that in Windows 10. I would recommend using an aggressive third party installer. Geek Uninstaller would work. I’m pretty sure most experienced users would utilize a third party uninstaller such as Revo or Geek without needing any prompting from me. On the other hand, less experienced users just might need a little assistance knowing where and how to uninstall a program using Windows built-in uninstaller. I did try to uninstall QuickTime. I get a message saying I do not have Administrative power to do this. I am the administrator for my computer BUT it says Windows Installer will not allow the uninstall. This is not the first time I have had this problem. Anyone know what the @#!$ this is about? Try this: Open the Start Menu and type appwiz.cpl into the search box. You should now see “appwiz.cpl” highlighted at the top of the results. Right click on appwiz.cpl and select “Run as administrator”. Click Yes in the User Account Control prompt and Windows programs uninstaller will now open with elevated privileges. Now try uninstalling QuickTime.